This dual-handle, reversible shower strap’s soft bristles cleanse and exfoliate, while its textured surface provides gentle massage. Flexible plastic. 31 1/2" x 5". Love this product! 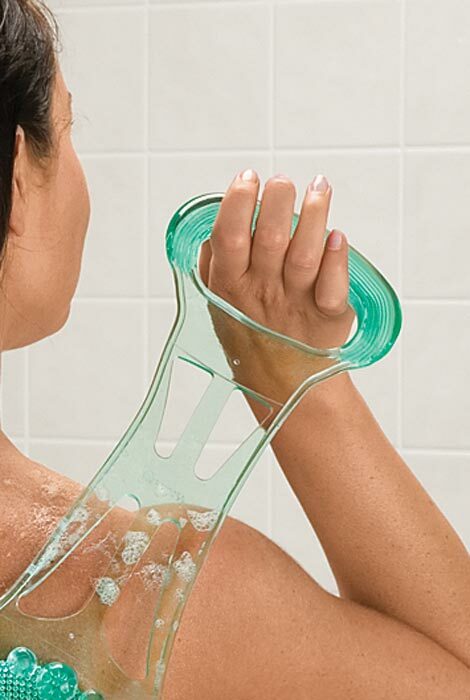 Easy to use, no longer have to call my husband to wash my back! I have a lot of back issues and this massages my back also. Would recommend for anyone. Dries quickly, no mildew! I love this cleanser. It feels terrific and when I am finished with the shower, I step on it and exfoliate my feet. My toes and heels love me for this. Looks like it will feel nice. Looks like a good way to clean a hard to reach area and like it will feel good. I'm a have shoulder problems and am unable to reach over my shoulder or behind my back so this is a perfect solution!